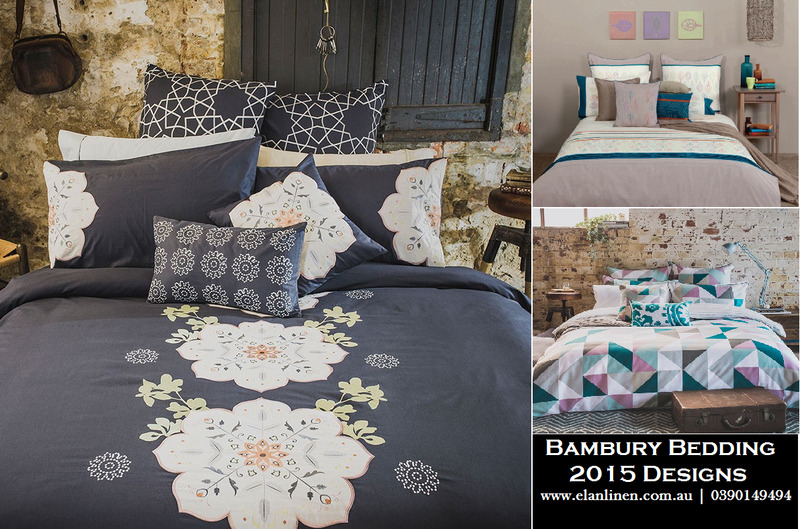 Bambury has supplied retailers and other wholesale clients with quality bedding, homewares and way of lifestyle items for a quarter century. They are presently supplied right crosswise over Australia and New Zealand, from little boutique blessing stores through to substantial general store chains and online retailers like Elan Linen. You can buy the best 2015 collection of Bambury quilt cover sets, Bambury bed sheet, quilts & adornments and choose your top picks. Anouk features a large floral pattern running down the centre of the quilt cover on a dark grey base composed of cotton percale fabric. The intricate embroidery and appliqué detail within this design combined with the soft and romantic pastel tones of the embellishments makes this a timeless floral centerpiece for the bedroom. Modern and sophisticated Lucia quilt cover set features a triangular design in a classic colour palette of pastels, grey and emerald green. Lucia bedding set is printed on white cotton sateen fabric and is fully reversible, with a small grey stripe on the reverse side of the triangles. The quitl cover is also finished with a small charcoal colored piping around the edges to make it look more appealing. Autumn Quilt Cover has fresh, modern design draws on Autumn leaves for inspiration. With splashes of green, orange, lavender and blue, it features hand-drawn leaves that have been transformed into an intricate array of embroidery. Made from cotton percale. The calming blue, green and grey tones are complimented with a simple yet stylish cross pattern on the reverse and a blue piping around the edge of the quilt cover. This Printed on luxurious cotton sateen fabric, this design features splashes of purple, blue and aqua green in a watercolour effect, combined with aqua green piping and a cross-hatched print on the reverse. The shades of blue, in this ombre effect, are printed on white cotton sateen fabric on both sides of the quilt cover. Maya Quilt Cover Inspired by traditional ikat patterns and Central American textiles, Maya is a playful mix of colour and pattern. Not only is it sure to brighten up every room, but the fabric is a woven cotton percale, so it feels luxurious as well. The brightly coloured embroidery and stitching detail allows Maya to be accessorised easily with lots of vibrant colour. Delphine Quilt Cover features a classic floral pattern of foliage in a unique multi-colour palette which makes it a stylish piece to update any bedroom. Printed on fabric that combines fine quality, lustrous linen with soft, durable cotton and complete with a cotton reverse for softness against the skin for ultimate comfort. BedT Reversible is made from 100% combed cotton jersey knit, designed to be as super soft, comfortable and breathable , making it cool in summer and cosy in winter. Features vibrant hues of purple and intricately drawn floral patterns inspired by traditional Indian motifs, which is what the name Malini suggests. With bright orange, lime, violet, and fuchsia on an indigo coloured cotton percale background, this design will liven up the room and can be accessorised with a large variety of colours.